In medieval times, a pilgrimage gave the average Joe his only break from the daily grind. For Gideon Lewis-Kraus, it promises a different kind of escape. Determined to avoid the kind of constraint that kept his father, a gay rabbi, closeted until midlife, he has moved to anything-goes Berlin. But the surfeit of freedom there has begun to paralyze him, and when a friend extends a drunken invitation to join him on an ancient pilgrimage route across Spain, he grabs his sneakers, glad of the chance to be committed to something and someone. 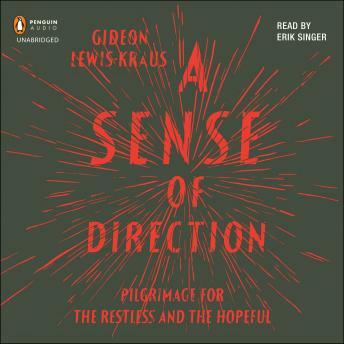 Irreverent, moving, hilarious, and thought-provoking, A Sense of Direction is Lewis-Kraus's dazzling riff on the perpetual war between discipline and desire, and its attendant casualties. Across three pilgrimages and many hundreds of miles - the thousand-year-old Camino de Santiago, a solo circuit of eighty-eight Buddhist temples on the Japanese island of Shikoku, and, together with his father and brother, an annual mass migration to the tomb of a famous Hasidic mystic in the Ukraine - he completes an idiosyncratic odyssey to the heart of a family mystery and a human dilemma: How do we come to terms with what has been and what is - and find a way forward, with purpose?